A nephew from Ontario visited us last year. He told us of the shocking reduction in bee numbers in Southern Ontario. The following information from Avaaz explains why. It is heartening to live here in New Zealand’s Far North where the bees are still buzzing. Please read the words below and sign the petition to ensure chemicals toxic to bees (and other life including humans) are banned. I find it interesting that Germans, hosts to Bayer – the chief manufacturer of these deadly poisons – refuse to allow these toxic sprays on their home turf. Why then should Bayer be allowed to export them to other locations? We recently met a local orchardist, growing conventionally using chemical inputs, who refuses to eat the food he grows, claiming it is too toxic. Farmers traditionally were the guardians of the earth. Isn’t it a shame that today’s money-based system forces farmers to grow food that even they won’t eat? Should you? This is just one more reason why we, as consumers, need to support local organic growers of quality food good for people and the planet. 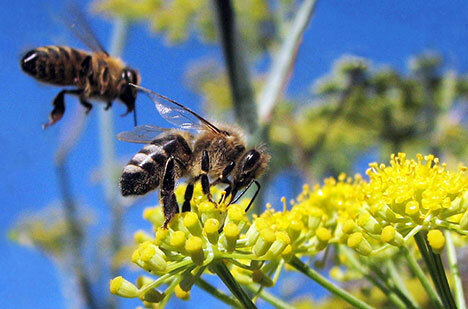 Sign below to support the enhancement of a healthier world for us and the bees. Wishing you a smile-filled day of sunshine and clean, invigorating air filled with the joyful buzzing of bees. Silently, billions of bees are dying off and our entire food chain is in danger. Bees don’t just make honey, they are a giant, humble workforce, pollinating 90% of the plants we grow. Multiple scientific studies blame one group of toxic pesticides for their rapid demise, and bee populations have soared in four European countries that have banned these chemicals. But powerful chemical companies are lobbying hard to keep selling this poison. Our best chance to save bees now is to push the US and EU to join the ban — their action is critical and will have a ripple effect on the rest of the world. Bees are vital to life on earth — every year pollinating plants and crops with an estimated $40bn value, over one third of the food supply in many countries. Without immediate action to save bees we could end up with no fruit, no vegetables, no nuts, no oils and no cotton. This issue is now coming to the boil as major new studies have confirmed the scale of this problem. If we can get European and US decision-makers to take action, others will follow. It won’t be easy. A leaked document shows that the US Environmental Protection Agency knew about the pesticide’s dangers, but ignored them. The document says Bayer’s “highly toxic” product is a “major risk concern to non target insects [honey bees]”. We need to make our voices heard to counter Bayer’s very strong influence on policy makers and scientists in both the US and the EU where they fund the studies and sit on policy bodies. The real experts — the beekeepers and farmers — want these deadly pesticides prohibited until and unless we have solid, independent studies that show they are safe. Let’s support them now. Sign the petition below.